A number of these images were drawn in Austria. I found it curious that some images of Saints played with scale. Thus a saint could be holding a whole church in his hand, or I played with the idea that a figure could have a whole panoply of animals in their arms. In Spitz Austria we went to a delightful ship building museum, the upper right is an image of hanging boat that I drew there. Also here you see various thoughts from scripture to a name of cartoonist we saw in Krems, and a head with budding plants. It all lands in the sketchbook. 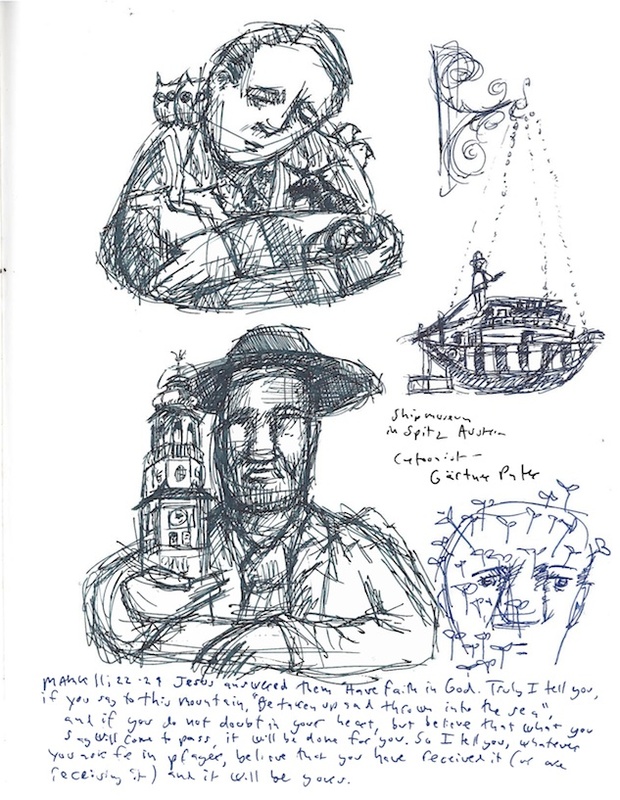 This entry was posted in Thoughts and Sketches and tagged art journaling, drawing, drawing as prayer, drawing in Austria, Saint Image, ship building museum, sketch, sketchbook, sketchbook images, sketchbook keeping, sketching, Spitz Austria, Tim Timmerman. Bookmark the permalink. Creative sketches. Gets the juices flowin’, thanks for sharing these.